Woven by hand, a geometric figure symbolizes the sun. Miguel Hernandez creates a table runner of extraordinary beauty. He combines ruby, aubergine, brown and maize on a black warp to achieve rich nuances of color. Bands of diamond motifs in black and red are a symbol of his family and appear on almost all his designs. 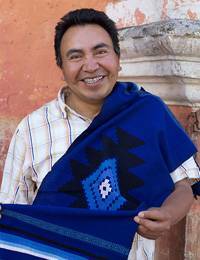 He names the table linen for Totonicapán, a Guatemalan town famous for its textile arts.